Going digital might be the new norm - but it’s not enough. 50% of S&P 500 companies will disappear by 2027. 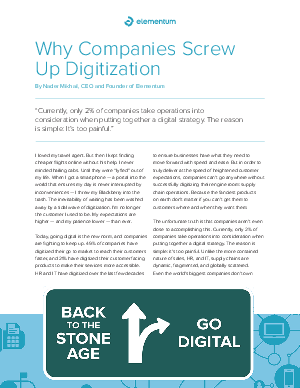 In order to truly digitize, businesses need to tie together thousands of disparate moving parts and break down deeply rooted structural siloes. To call this endeavor a headache - is the understatement of the century. Instead, companies have been choosing to stick their heads in the sand. But with the expectations of today’s customers, there is no choice; companies must cut through the noise of buzzwords and one-off initiatives. Here are a few things to keep in mind to get your team on the right path and push forward with an effective solution.